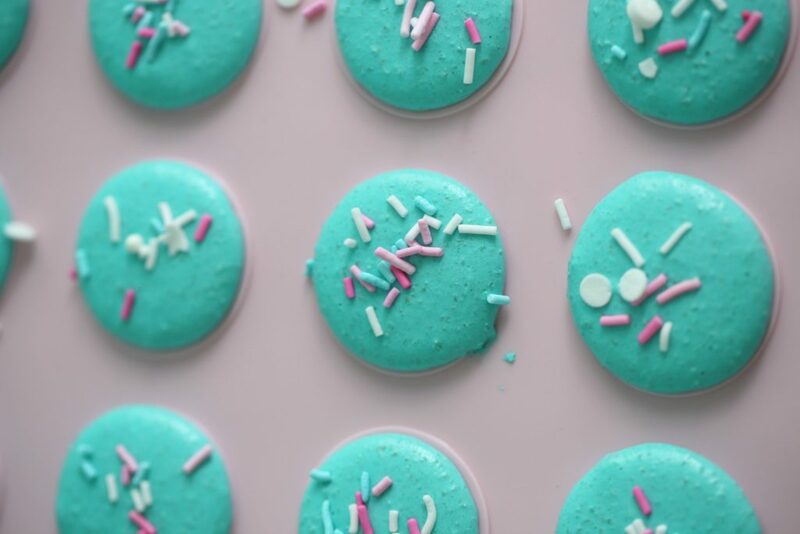 It´s Valentine´s Day soon, how about baking some pretty macarons, These vanilla macarons are sprinkled with pastels sprinkles right before baking, and filled with a white chocolate ganache. 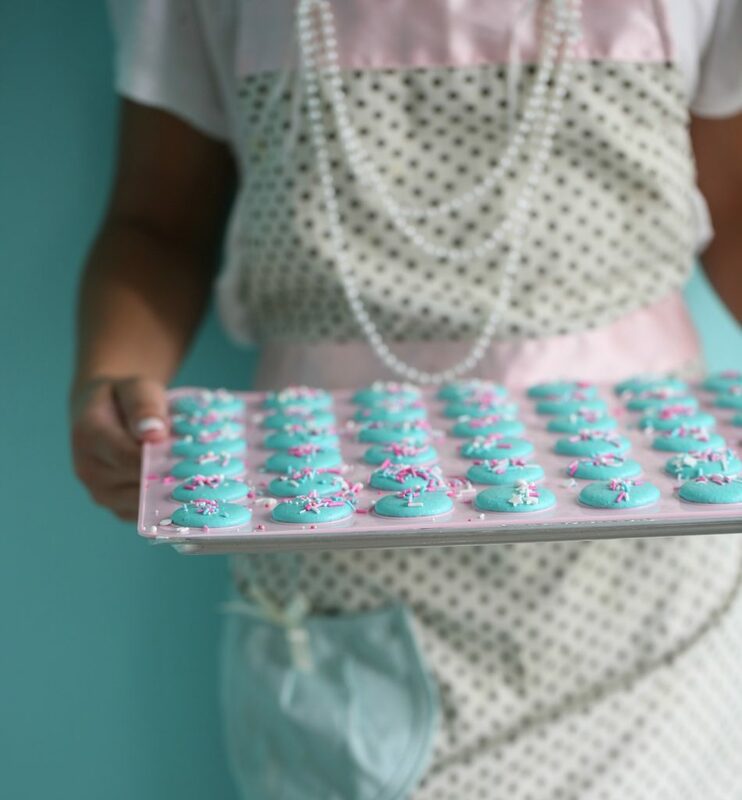 If you find it difficult to make macarons, there is a video on my youtube channel, you can watch, see the video here. 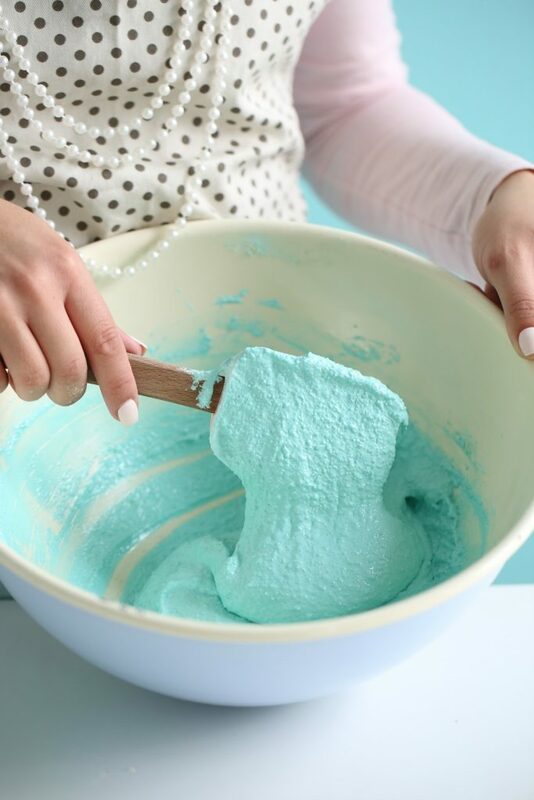 You can make any color, and use any sprinkles you love, and fill it whatever you love the most. 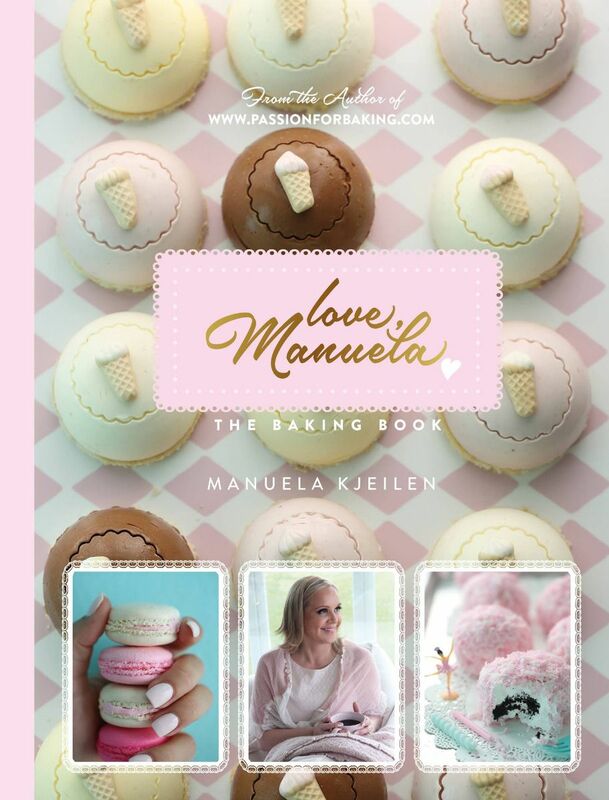 This recipe is from my English book Love Manuela, that you can order here. Preheat oven to 275F° (135 C°). Use the convection setting for this recipe. 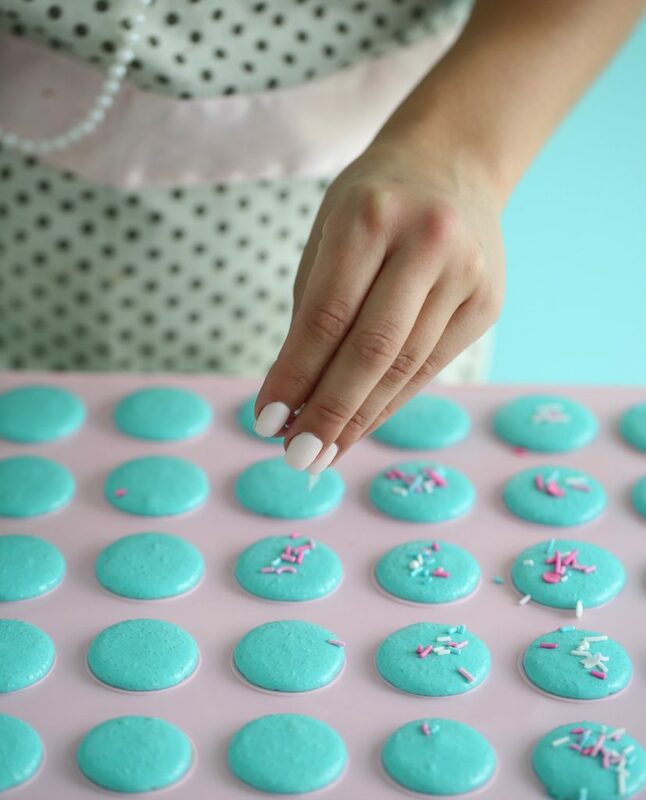 Line two baking sheets with silicone macaron baking mats or with silicone baking mats. Place 6 fl. oz. 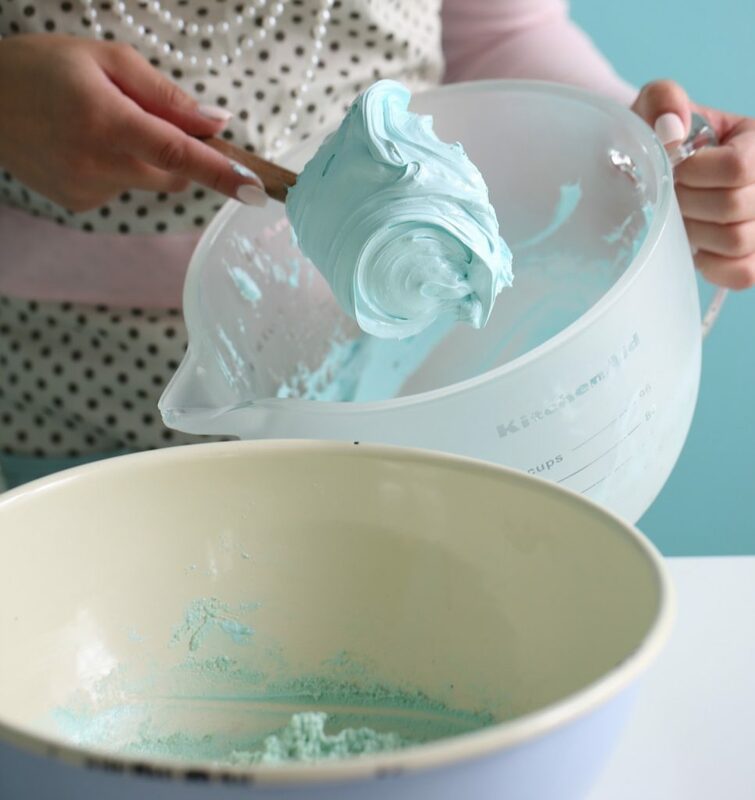 (80 g) egg whites in a standing mixer bowl fitted with the whisk attachment. Bring the water and sugar to a boil in a small saucepan over medium heat, stirring slowly. When mixture starts to boil, remove the spoon and attach a candy thermometer to the saucepan. Once the sugar syrup temperature reaches 235F° (113C°) begin whipping the egg whites on high speed. 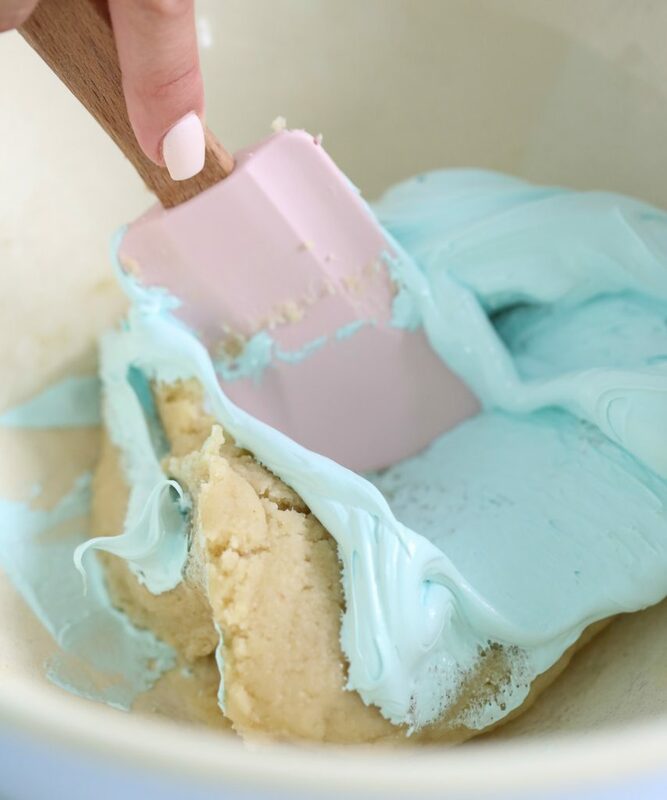 When the sugar syrup reaches 240F° (115C°) and the egg whites are foamy, remove the syrup from the heat and slowly pour it into the whipped egg whites, avoid pouring syrup onto the whisk. 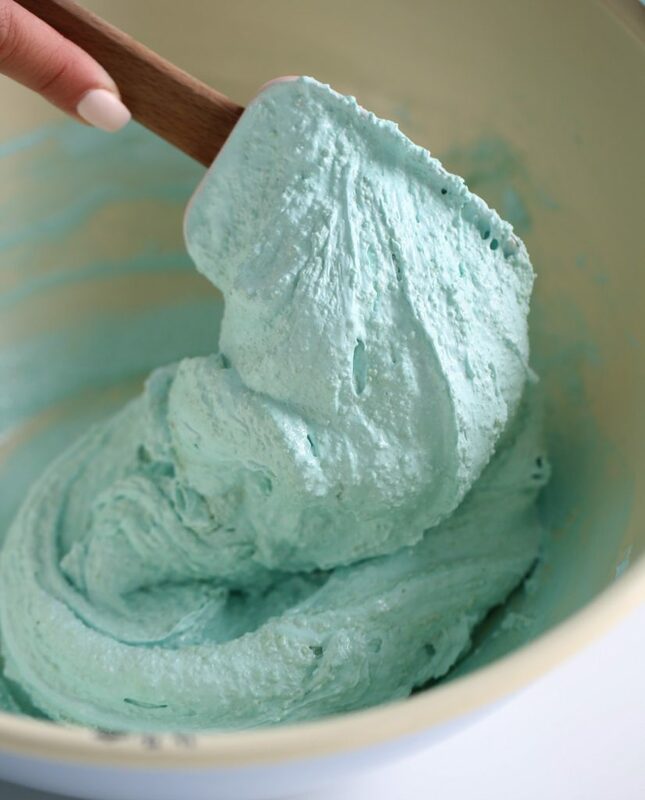 Add vanilla bean paste or seeds of a vanilla bean and a few drops of food coloring while mixing if desired. Meanwhile, combine/sift confectioners’ sugar and almond flour in a large bowl. Add the remaining egg whites( 6 fl. oz. (80 g) combine with a silicone spatula to evenly moisten all the ingredients. Mix in a small amount of the cooled meringue into the almond mixture to loosen the batter, and then fold in the rest of the meringue into the almond mixture until a smooth batter develops and flows like “lava”. Check mixture often to avoid over-folding. 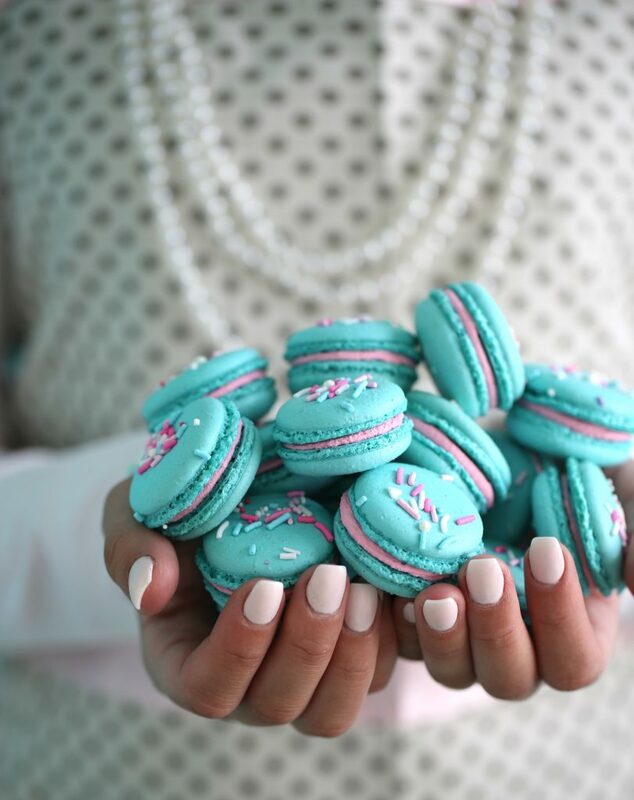 Sprinkle the macarons with beautiful sprinkles of your choice. 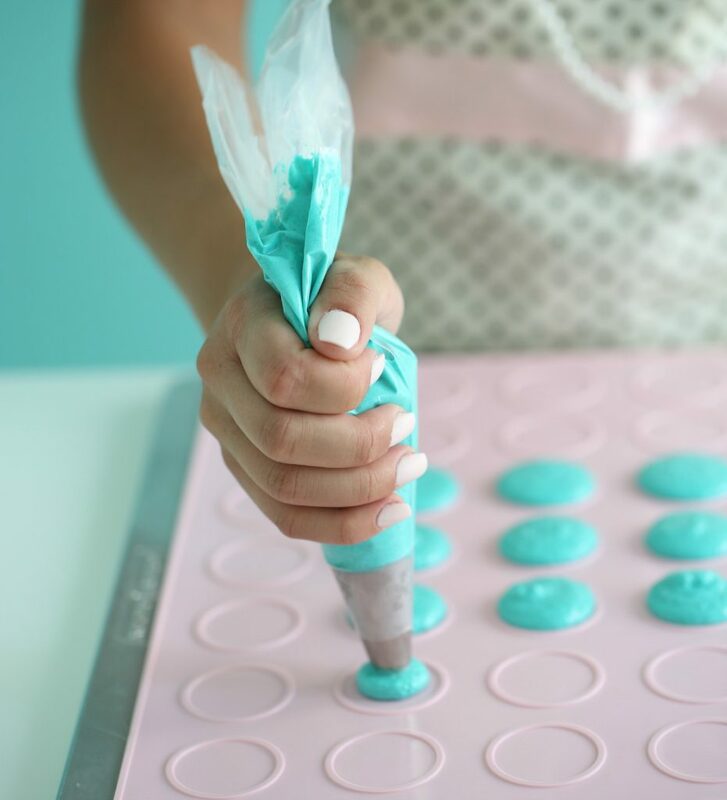 Bake for 12 minutes; there is no need for you to wait until the piped cookies are dry to the touch, as many macarons recipes instruct, you may bake them as soon as they are piped. 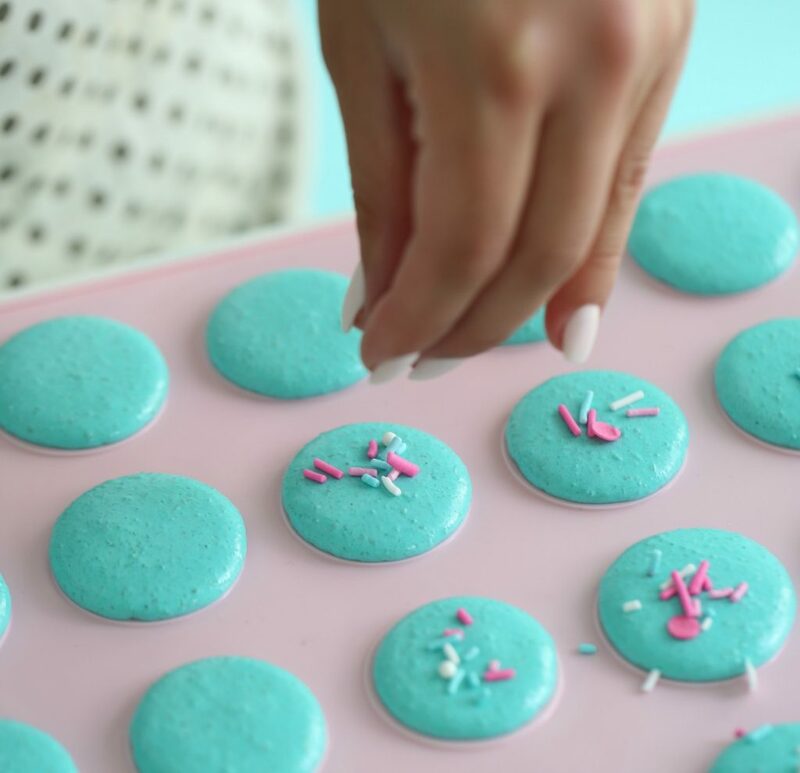 To check if the macarons are ready, touch the top of the macaron and try to wiggle it. The cookies are done when the top is firm and does not wiggle. 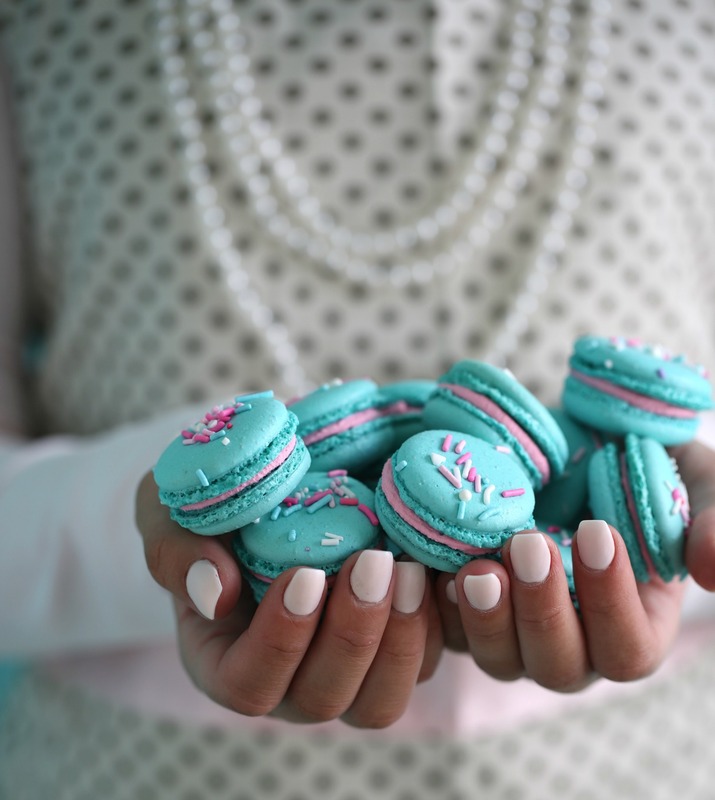 Refrigerate the macarons, stored in airtight container, for up to 2 weeks. Serve at room temperature. Place the chopped white chocolate in a medium bowl. Use high-quality white chocolate for a great taste. Bring heavy cream just to a boil and pour over the chopped white chocolate. Stir with a spatula until chocolate is melted and smooth. Add any extract of your choice to your taste and food coloring if desired. Allow the mixture to cool for about 1 hour before filling the cookies. 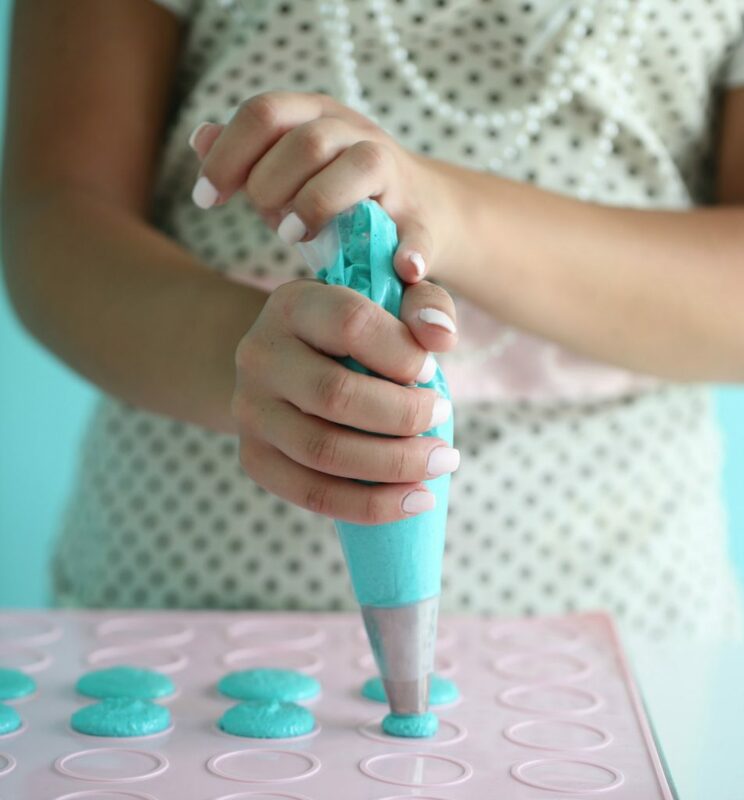 Fill a piping bag with the white chocolate ganache, make a small dot of the cream on your cookie, sandwiches your macaron with another macaron. *NOTE: It is very important that the measurement of egg whites be accurate. I would recommend that you weigh the egg whites, you can use eggbeaters. FEW STEP BY STEP PICTURE.